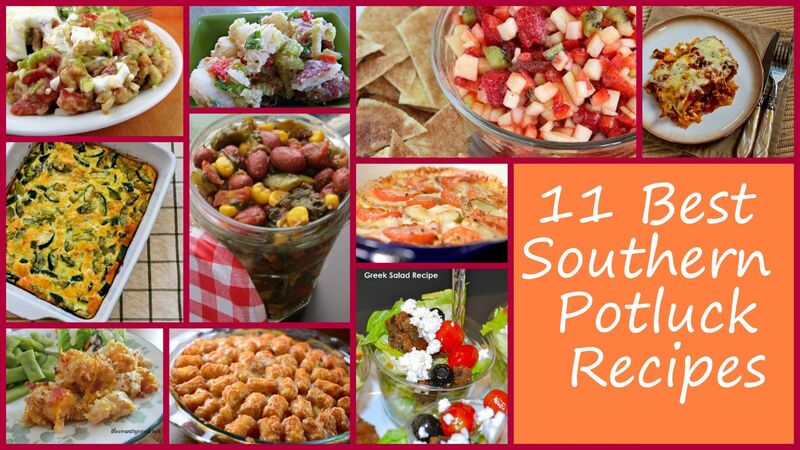 If you’re looking to make your southern potluck a smashing success, FaveHealthyRecipes.com has you covered. We’ve gathered the 11 best southern potluck recipes that will make your party a hit. From simple casseroles, to the perfect salad, and even the best sweet tea, we have the recipe for you. Your Southern potluck just got easier and now you can enjoy the company of family and friends and spend less time in the kitchen. These are 11 must-try potluck recipes that you will love. 1. Texas King Ranch Chicken Casserole - This famous Texas chicken casserole recipe is fit for a King. With big chunks of chicken, melted cheese lots of veggies and spices, Texas King Ranch Chicken Casserole lives up to its royalty. Every bite is filled with cheesy deliciousnessTry it tonight and you will not be dissapointed. 2. Easy Tater Tot Casserole - This is a casserole that the whole family will enjoy. This cheesy tater tot casserole is the perfect side dish for your next potluck. It is filled with cheese, sausage, and kicking mushroom gravy. It will make everyone's mouth water. Eating tater tots has never tasted so good. This is a great year-around dish that will satisfy any hungry eater. Try this Easy Tater Tot Casserole recipe for your next meal and you will love the creamy, cheesy goodness. 3. Fruit Salad with Baked Cinnamon Chips - Chips and salsa just got a sweet makeover. Fruit Salad with Baked Cinnamon Chips is a delicious and healthy snack recipe for parties, for an appetizer, or just for you. With fresh fruit and crunchy chips, this is a treat you don't have to feel guilty about. 4. Mayo and Egg Free Potato Salad - Spice up your next barbecue with a potato recipe for the ages! Jamie from Thrifty Veggie Mama excludes some of the traditional add-ins with her Mayo and Egg Free Potato Salad recipe, but the resulting dish is still delicious. Capers, dill, vinegar and mustard contribute to the bold flavor found in this healthy side dish. This easy potato salad recipe also goes way beyond the spud with the inclusion of celery, carrots and bell pepper for color and crunch. 5. Monster Zucchini and Basil Strata Recipe - There's nothing like fresh vegetables from a home garden. Why not use the fruits of your labor in this Monster Zucchini and Basil Strata recipe? Smothered in cheese, this zucchini strata is the perfect egg casserole for your family. This is a casserole that you can count on everyone loving. 6. Greek Salad Appetizer - This is a perfect appetizer that is light and healthy and won't fill you up too much before your big meal. The Greek Salad Appetizer is a Greek salad in a small cup that has crunchy and roasted toppings. It is an easy appetizer that will be loved by the whole party. The individual salad bites are filled with delicious toppings that make it near impossible to just eat one. Enjoy the taste of summer with these perfect appetizer salads. 7. Tomato and Potato Cheese Bake - If you are looking for a simple, quick casserole, than look no further. It does not get any easier than this. The Tomato and Potato Cheese Bake is layered veggies with melted cheese that is sure to please anyone. Make this side dish with your next meat dinner and you will have a new favorite meal. No odd ingredients, just simple and tasty ones that make this easy baked casserole delicious. 8. Deconstructed Stuffed Cabbage Casserole - Courtesy of Kalyn's Kitchen comes a healthy casserole recipe that fits right in with your healthy lifestyle. The Deconstructed Stuffed Cabbage Casserole is great way to work in a low-glycemic vegetable (cabbage) by way of a generous, delicious meal. Combine cabbage, lean ground beef, tomatoes and rice with aromatic spices and olive oil for a tasty and plentiful dinner idea. 9. Cheesy Chicken Tater Tot Casserole - Cheesy Chicken Tater Tot Casserole is a great summer slow cooker recipe. With cheesy and bacon-y goodness, this could be great for breakfast, lunch or dinner. Lower-calorie substitutes are optional. 10. Dollar Store Cowboy Casserole - If cowboys ate dollar store food during cattle drives, then they would probably eat this Dollar Store Cowboy Casserole recipe. Chock full of vegetables and spices, this low cost recipe may be far tastier than you would think. Serve this cowboy food-inspired casserole as a zesty side dish or as a meat free main dish option. 11. Southern Style Sweet Tea - Looking for the perfect way to enjoy organic tea? Try making Southern-Style Sweet Tea. One glass of this southern sweet tea recipe will dissolve your cares away. It is sweet and refreshing and is hard to ignore.